How will the Sugar Tax affect your dog? Last Friday, the UK government introduced the “Soft Drinks Industry Levy”, better known as the Sugar Tax. Aside from giving future GCSE economics students a headache, the Sugar Tax’s main objective is to lower obesity by strongly penalising manufacturers who put a lot of sugar in their drinks. The problem, the government contends, is people are too fat, which is becoming a burden on the NHS. Because people are unable to look after themselves properly [editorial note: this may be hyperbole], the government is having to step in to make them healthier. Rumour has it that upcoming legislation will allow government agents to make people go jogging by chasing them down the street with pointy sticks, but until that happens they have settled on discouraging people from consuming sugary drinks by taxing them to hell and back. Makers of soft drinks with more than 5g of sugar per 100ml will pay 18p a litre in tax, which increases to 24p a litre if the sugar content is over 8g per 100ml. The idea is they will put the cost onto the consumer, discouraging people from buying unhealthy drinks. Many food and drink manufacturers have been left worried by this development. There is concern that similar taxes will be put on a broader range of confectionary, and many manufacturers are getting ahead of the game by transitioning to sugar-free products. The exact outcome of this is yet to be observed, and there are arguments for and against to be made, but there is one issue that has gone largely unnoticed in the debates. 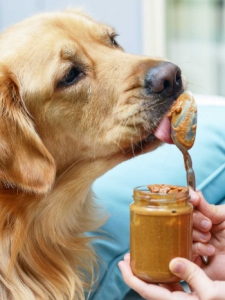 Dogs love peanut butter. Nothing wrong with that. Peanut butter is tasty, makes a great treat for a very good boy, can work as a handy distraction if you need to trim their nails, and is useful for hiding yucky pills in. There are also no documented cases of dogs being allergic to peanuts, so there are no health issues to consider. Or, there wasn’t, until manufacturers started making peanut butter using a replacement product called xylitol. It’s harmless to humans, but is highly poisonous to dogs. Yet, according to a survey by Preventive Vet, over half of respondents to a survey had no clue about this, something which is reflected in the thousands of poisonings that happen every year. Xylitol has been in some peanut butter types for years, but it has still been comparatively rare. Because of its anti-cavity properties for human teeth, it is more commonly found in sugar-free gum, mints, toothpastes, and mouthwashes, and there have been cases of dogs getting at their owner’s chewing gum, eating the packet and dying. However, it has increasingly been favoured as a sugar substitute for snacks. The Animal Poison Control Centre offers a good overview of the history of how xylitol has become more prevalent in consumer products over the past decade, but the central reason is that it offers a good sugar substitute because it triggers insulin production in the human body. However, that same chemical reaction causes hypoglycaemia and acute hepatic necrosis in dogs. As little as 0.5 g/kg is enough to trigger liver failure. The fear is that, as sugar becomes increasingly unfashionable, more products will start using xylitol. Countries as varied as Portugal, Sri Lanka and Saudi Arabia already have taxes on sugary food. Many dozens are coming close to implementing their own sugar taxes, and with it dogs around the world are going to be in danger. The problem as it stands is ignorance. Many people do not know the dangers of xylitol, and cases where dogs could be saved are ending in tragedy because owners are not realising the urgency of the situation. A campaign of education is required, before more dogs succumb to death by peanut butter.